The below information pertains to the 2019-20 University of Florida College of Dentistry (UFCD) Need-Based Scholarships application cycle. The 2019-20 scholarship application will be available in late March. Applications are due by 11:59 PM ET on May 31, 2019. Do I have to apply this year if I applied for UFCD Need-Based Scholarships last year? YES. You must apply each and every year if you wish to be considered for UFCD Need-Based Scholarships. All applicants are equally considered every year, and previous recipients are not guaranteed to receive a scholarship again. Did I have to submit my 2019-20 FAFSA by Dec. 15, 2018, to be eligible for scholarships? Students whose FAFSAs were received at UF by the Dec. 15 deadline will be given priority in the scholarship evaluation process. Students with late FAFSAs are not guaranteed consideration for UFCD scholarships. I’m not sure if I submitted a 2019-20 FAFSA / I’m not sure if I provided parent information. How can I check? I submitted my FAFSA on time but didn’t provide parent information. Can I still apply? Yes, you can still apply. However, you must update your FAFSA with your parent information by the scholarship application deadline of May 31, 2019. Please note: Adding parent information does not change the date that your FAFSA was received at UF. Your FAFSA record will show your original receipt date as well as the date(s) on which updated information was received. 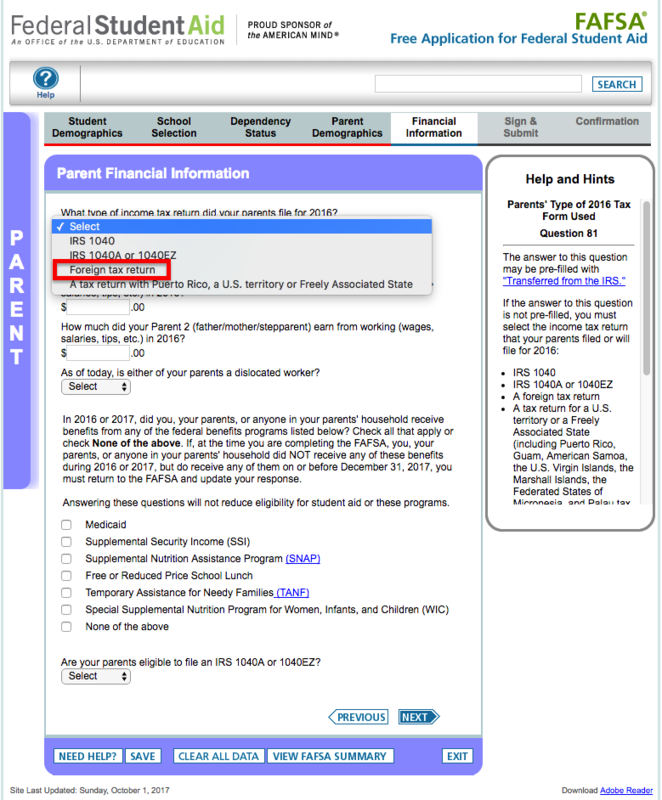 How do I add parent information to my FAFSA? You will then be taken to the parent sections of the FAFSA and may enter information accordingly. 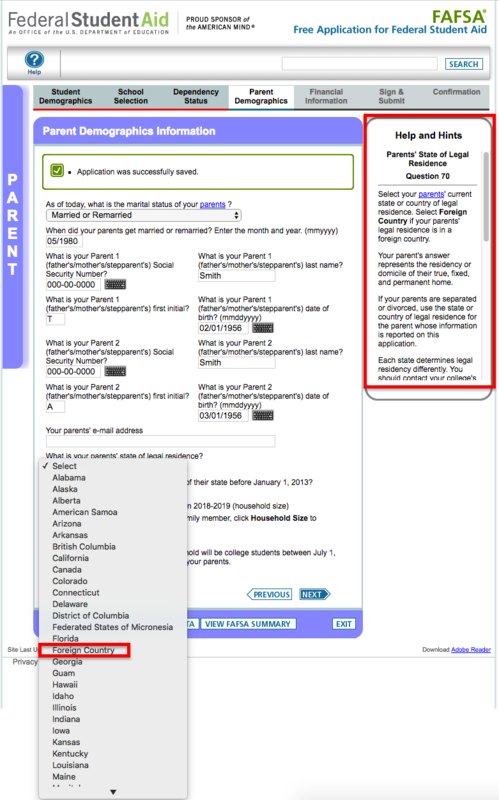 You are strongly encouraged to use the IRS Data Retrieval Tool to transfer your parents’ tax information from the IRS directly to the FAFSA. Do your parents reside in a foreign country? Did your parents not file 2017 taxes? Click here for tips to help you enter tax information correctly under these circumstances. When you are finished, be sure to navigate to the “Sign and Submit” tab to electronically sign your FAFSA. This action is what triggers your updated FAFSA to be sent to UF. It generally takes 2-3 business days for updated FAFSAs to be received and processed by UF. 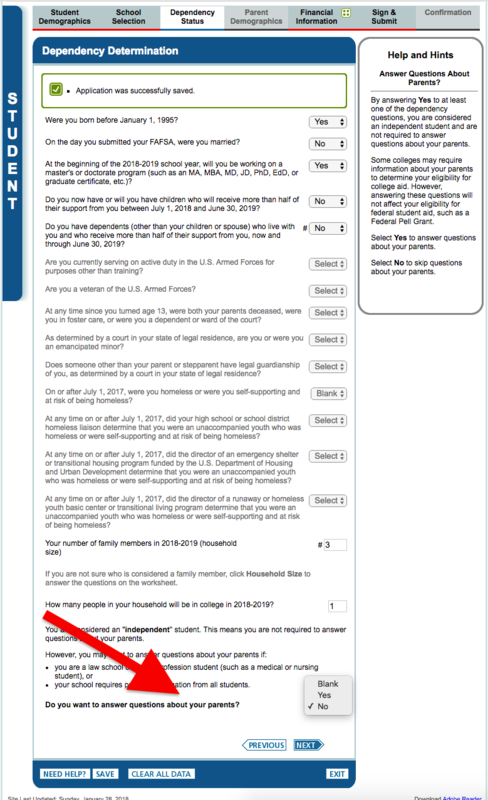 Are all scholarship applicants required to provide parent information on their FAFSAs? Yes. Exceptions may be made on a case-by-case basis for students with special circumstances that prevent inclusion of parent information. You must document such special circumstances on the scholarship application if you wish to be considered for an exception. Submission of a special circumstances statement does not guarantee that an exception will be granted. Please note: If your parents reside in a foreign country and/or do not file taxes, those circumstances alone do not exempt you from the parental information requirement. See below for tips to help you input parent information for residents of foreign countries and non-filers. If I am not receiving financial assistance from my parents, why do I need to provide parent financial information on my FAFSA? Scholarship funding is limited. Since all dental students are considered to be independent by FAFSA and the majority of dental students demonstrate some level of financial need, parental information helps to differentiate levels of need among students. My parents live in a foreign country and don’t file U.S. taxes / My parent(s) did not file a 2017 tax return. 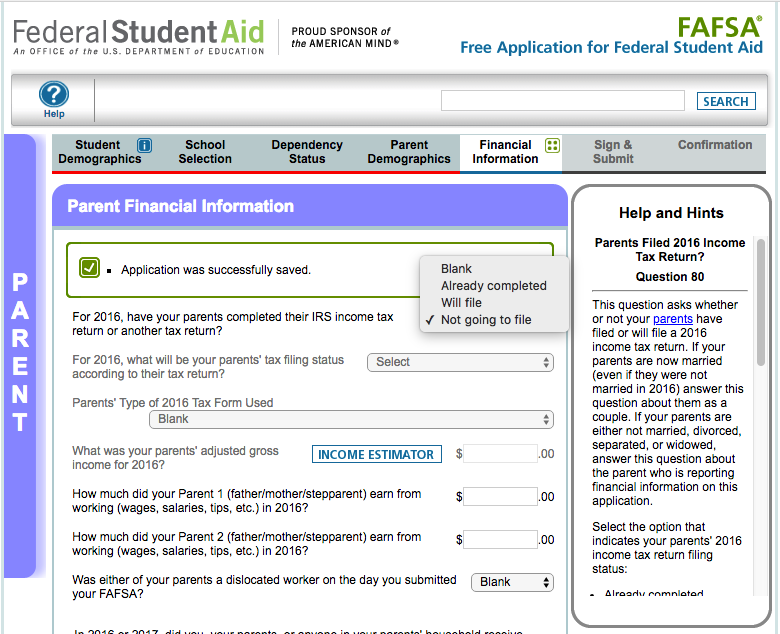 Can I provide parent information on my FAFSA? Yes. The FAFSA accommodates for both of these situations. Use the below tips to help you input your parents’ financial information. Note: Please follow the directions here if you need help finding the parent information section of the FAFSA. Does providing parent information on my FAFSA affect my eligibility for federal loans? No. Federal Direct Unsubsidized and Graduate PLUS loans are not based on financial need. Therefore, neither your income nor your parents’ income is considered when awarding those loans. If I am selected for a UFCD scholarship, does that affect my eligibility for federal loans? No, it does not; you will still be able to borrow federal loans. The good news is that you are able to borrow less in loans, saving yourself thousands of dollars. Remember that the total amount of financial aid you can receive each academic year is based on your cost of attendance (COA). Scholarships and grants are always counted toward your COA before loans. For example, if your COA for the year is $40,000 and you receive a $10,000 scholarship, the maximum amount of loan money that you can borrow is $30,000. In this scenario, your total financial aid is still $40,000; you would simply have 2 different types of aid making up your package. In the above example, you would be saving yourself more than $10,000 by borrowing less in loans. Due to interest, you would actually be saving yourself approximately $14,000-$15,000, depending on the length of your repayment term. What does the first page of a federal tax return look like? Click here for an example of the first page of a federal tax return. This is the only page of the tax return that you are required to submit. Why am I being asked to provide 2017 tax information? Should I update my FAFSA with 2018 tax information once my taxes have been filed? UFCD follows Department of Education (DOE) guidelines for determining and analyzing financial need. Since DOE is using only 2017 tax information to determine need for 2019-20, UFCD is following suit. Use of 2018 taxes would exceed the bounds of DOE regulations. You do not need to (and should not) update your 2019-20 FAFSA with 2018 tax information, nor do you need to update your scholarship application. My parents live in a foreign country and don’t file U.S. taxes / My parent(s) did not file a 2017 tax return. How can I document their tax status? 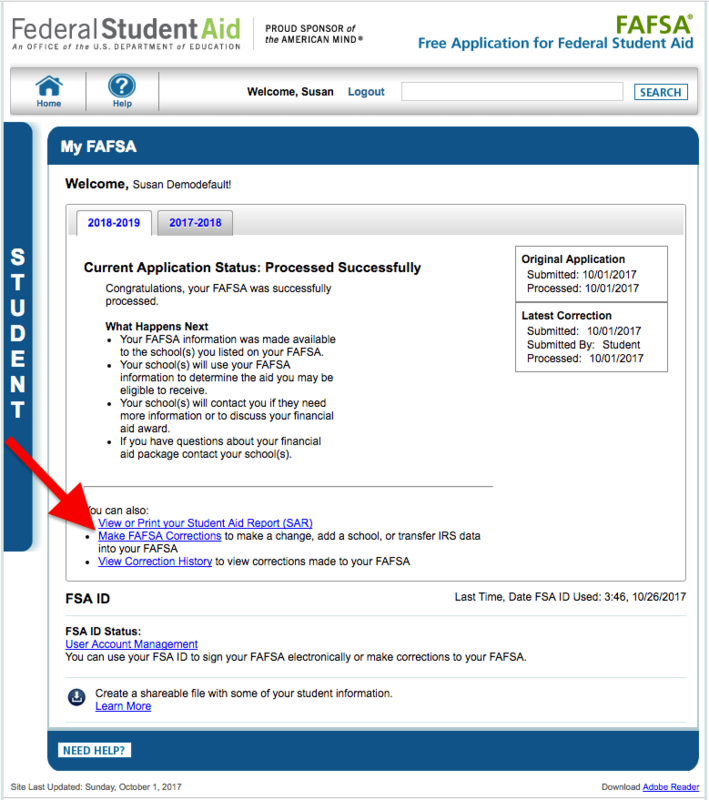 If you have followed the tips here, your FAFSA will include a notation that your parents filed a foreign tax return or that they did not file a tax return. You are not required to provide additional documentation beyond the FAFSA unless requested to do so by the Scholarship Committee. Do I need to provide copies of 2017 state tax returns? No. We only need page 1 of your and your parents’ federal tax returns. The federal tax return is generally Form 1040, 1040A, 1040EZ, etc. Click here for an example of what you need to submit.